It’s already 7.15 – full daylight, although that won’t be the case for many more weeks. Elisha Trewartha is settling into the working day. He’s a “middle-aged man… the foreman” at Upton Towans Dynamite Works, Gwithian. We know little about Elisha: he's 54 years old and was born in Gwennap and baptised at the Wesleyan Methodist Chapel, son of Mark and Elizabeth. His father ws a copper miner and later a mine agent and the family lived in Little Carharrack. 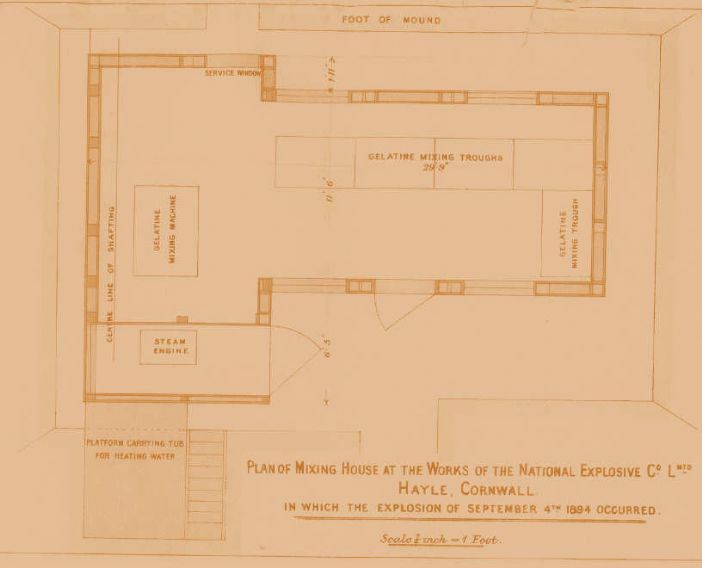 Elisha was the oldest of nine children and by 1861 had left home and was probably living in Woolwich which may suggest that he was working at the arsenal and his interest in explosives was already present. Is he happy in his work? How is his domestic life? His name might suggest an unusual interest in the Bible, and perhaps a yearning for prophetic voice, in the parental home. So - is he a hymn-signer? Given to extempore prayer? Is he a teetotaller, or a drinking man? Has he had a good night’s sleep, and is he looking forward to a bit of breakfast? Whatever his appetite, Elisha has barely another 90 minutes to enjoy his normal working day. For this is the dynamite works, where anything can happen. And today it will. But not quite yet. And so Elisha stops for a chat with Samuel Pick Craze, who has arrived early, but is soon joined by his team-mate, James Perry. As usual, they will be making gelignite today. The very names of the product, and of the ingredients involved – nitroglycerine, nitro-cotton – evoke risk; the unpredictability of volatile substances. Elisha, as foreman, emerges as a careful and responsible man. He will later show his respect for the materials, when he is called upon to describe the process, and proceeds thus: “The nitroglycerine is brought from a preparation house and placed in a tank, of which there are five. Nitro-cotton is brought from the drying house; the two compositions are placed in a tank and mixed together until, heat being gradually applied, they become a jelly. They are mixed by means of a wooden spoon or spud and kept constantly turned until they become a perfect jelly. This might take two hours; the materials take their own time. But when the time is right, the mixture is placed in a machine…. transferred bit by bit”. 20 times or more, the “spud” is filled at the tank, and gingerly carried across to the steam-driven machinery that will receive the “perfect jelly”. It is the language of science Elisha is deploying here: “is brought”, “are mixed”. The impersonality of the passive voice. It is easy to forget, from his account, that this workplace is peopled. But here they are: the foreman, the workmen, and a few with walk-on parts. Elisha leaves Craze checking the machine; he leaves Perry at the tanks. An hour later, he looks in on the men. They are doing well enough. “There was already some of the explosive mixture in the machine, I am quite certain”, he will explain later, “and Perry was about to scrape out the tanks. The explosive, passed through the machine, was being placed in boxes, which were on the floor between the machine and the tanks…. the two men had stopped to speak to someone at the back of the building… I stopped there three or four minutes and then went away”. Thus Elisha, carrying on with a foreman’s business. He is 100 yards away when the explosion comes. It’s said afterwards that an axle from the machine has been found half a mile away. It’s also said that the remains of Craze and Perry can only be identified by their facial hair. Faced with the volatility of the “perfect jelly”, Elisha’s scientific tone, his care and exactness, will fail him. “I cannot account for the explosion” he will say at the inquest, as if still shocked and bewildered: “I have no theory and cannot come to any conclusion. Everything was in perfect working order and the explosion very much surprised me, for I had no reason suspect even the probability of such a thing. One man was 54; the other 30. Both were very comfortable the one to the other, and I don't think they were larking or playing. I never heard of a disagreeable word between them or any boxing or anything improper, or of pipes, tobacco, or matches.” Neither was a drinker; neither prey to low spirits. The machinery? Elisha makes sure it is clean, he attends to it himself. There are all manner of theories. Some are mundane, as the causes of accidents generally are: spilt material, over-heating; a disturbance to the machinery. Other theories are more fanciful: suicide, electricity from a lightning strike. The inquest jury take only half an hour to decide on “accidental death” – the cause unknowable, and nobody to blame. But Elisha – what does he think; the following week, year, or (if he is spared) decade? That is something else that we shall never know.